Stephen Johns is camping out in Vancouver and reporting back on the 2010 Winter Olympics—with a focus on how they’re transforming one of Canada’s major urban centres. In case we needed another reason to start planning that direct rail link between the city and the airport, here’s one: Vancouver’s is now open. And it’s absolutely exquisite. 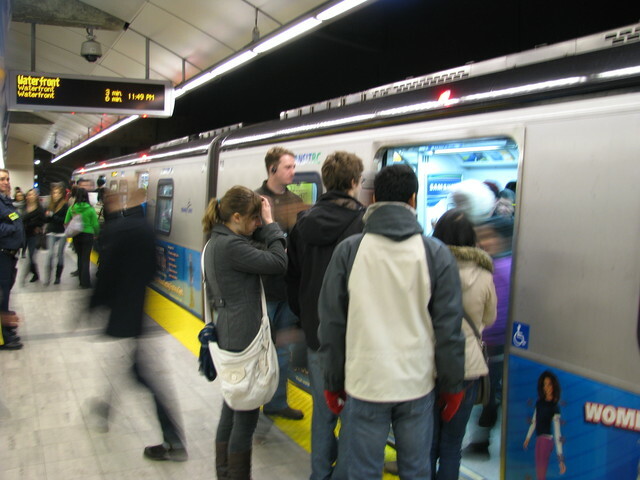 The Canada Line—which connects the downtown core with the suburb of Richmond and Vancouver International Airport—became operational last August, and it is a perfect example of what Toronto should have. It’s efficient. It’s well-designed. It’s clean. And it doesn’t cost much to use: each ride is five dollars, or two dollars more than taking the TTC to Kipling Station and then transferring to the deplorable “Airport Rocket” (and yes, we’ve missed flights because we’ve waited so long for that bus to arrive). It wasn’t cheap—the total cost was north of two billion dollars—and it’s expected to lose money until 2025, but the Canada Line is already approaching a hundred thousand riders a day. All things considered, the project has to be considered at least a qualified success thus far. Vancouver’s Olympic legacy will take years to fully manifest, but the immediate effects are already visible in the shape of two massive infrastructure projects. The other one, the upgraded Sea to Sky Highway between Vancouver and Whistler, has made a once-notorious stretch of road exponentially safer. But it’s the Canada Line that stands to have the longest-lasting impact on the city and its residents, both by making the airport more readily accessible and by opening up large portions of Vancouver’s western suburbs. (It’s also worth mentioning that the Canada Line has simplified public transit between Vancouver and the Tsawwassen ferry terminal, which makes it much easier to access—among other places—Victoria.) Vancouver had been toying with the idea of building the Canada Line for years; it took a major international athletic competition to set the wheels creaking into motion. Sound familiar? There’s hope that the 2015 Pan-American Games might resurrect a direct rail link between downtown Toronto and Pearson International Airport, although there’s certainly no guarantee that’ll be the case. We know this is a complex issue, not just in terms of funding but also (among other things) design matters, environmental factors, and zoning concerns. But it’s gotten to the point where it makes too much sense not to happen: quite simply, it’s ludicrous that an urban area of 5.5 million people doesn’t have effective public transit to its one major airport. (In 2008, Torontoist reported on the train linking Hong Kong with its new international airport; then, as now, we argued in favour of building our own version sooner rather than later.) The Canada Line is a great example of what we should be striving to build. It might be a stretch to suggest that a rail link to Pearson is absolutely necessary for Toronto to claim “world-class city” status, but it certainly wouldn’t hurt our already impressive credentials. Just ask Vancouver.